Welcome to the first only deli store in Singapore specializing in products from the IBERIAN peninsula, including delicious cured hams, spicy chorizos, and other delicacies from the area. We are finalizing the last details to bring you our line of Iberico products, imported straight from Spain, for your restaurant, catering service, event, or just the next gathering with friends. Stay tuned. 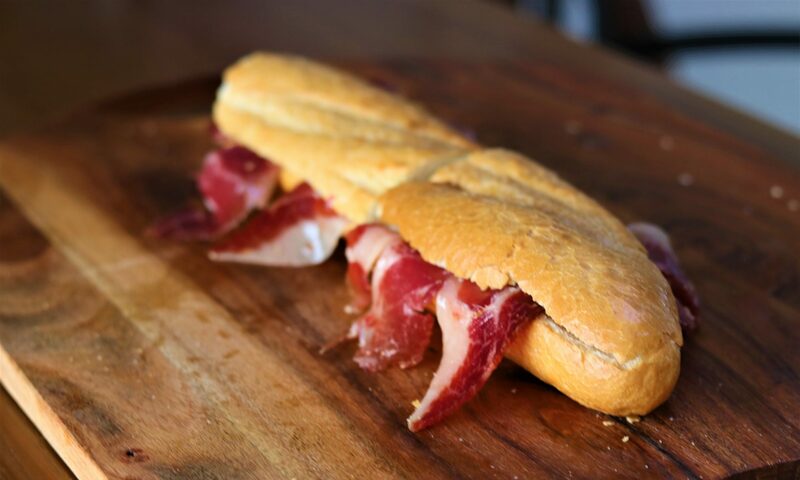 In the meantime, come try our Jamon Iberico at our temporary pop-up store at B1 11/03, One Raffles Place. We love food, and like most of our friends we also travel chasing after delicious treats and deli products from around the world. One of them is the Jamon Iberico, the amazing product of years of curing of the native breed of the Iberico pigs, known the world over for their superior taste profile. After going back and forth to Spain for the past three years, chasing for the best grower of black pigs, the Pata Negra, we finally found the best tasting one. The line of products is of the highest quality and we’ve managed to secure a good deal on their pricing, so that we can make these delicacies available to our customers at a truly affordable price. Mix and match the cold cuts items to make your own platter. Priced by weight. Sandwich platter for corporate functions, $6.50/piece. Come try our products at our temporary pop-up store at B1 11/03 One Raffles Place. Free delivery for orders $150 and above.